Did You Just Build Your Strategy on a Shaky Foundation? 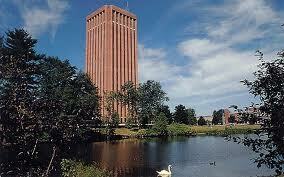 In 1974, the University of Massachusetts at Amherst completed building the W.E.B. Du Bois Library. It’s a glorious 26 story, red bricked honor to education of the 25,000+ students of the university. I believe it is still the tallest library in the United States. Besides for all the knowledge that resides in the building, it also has some of the best views of the Pioneer Valley, especially during the fall. The library is a beacon to the center of campus, and a unforgettable image I will always carry with me. Umm … there is one small problem, the library is sinking. While it might be urban legend, every UMass attendee has heard the story of the library being built, but the architect and engineers forgot to calculate the weight of the books and equipment. The foundation is not strong enough to support. It is said to be sinking anywhere from ¼ – ½ inch a year. Consequently, occasionally a brick or brick parts fall to the ground at a speed of 9.8 meters per second squared. Culture: Every company has a culture. The problem is most company culture’s are weakly internalized by associates, non productive, overly complex, and bullcrap. If you culture is not clearly articulated, visible and available, you will fall into the category of companies stated previously. Culture is too important to be considered tacit knowledge. Culture is how people work and behave. A strong, articulated, and internalized culture helps individuals exercise responsible freedom. It allows them to make the right decisions for your company, autonomously. It breeds trust and openness. It is a knowledge and understanding that is part of everything from communication to teamwork to respect of your customer. Make sure your culture is articulated, and better yet written and visible to all. Make sure it is discussed frequently. Build it into your performance management systems and processes. Make sure it is internalized and engrained in everyone. Attitude is not driven by policies, it’s driven by culture. Best Talent: Popularized by the best seller Good to Great, make sure you get the right people on the bus, then figure out where to go. Poor, mediocre and even ‘ok” talent is a waste of time; it destroys value. Be honest with yourself, do you have the best possible people at each critical position within your organization. By having the best talent at your critical positions within your organization, your business as usual will go smoothly, all of your reports will develop quicker, and innovation will flow. The best talent knows how to delegate effectively, removing them from the trees and allows them to see the forest. Technology: Just like any good tool, technology gives you leverage. The right technology allows you to work smarter and more efficiently. This doesn’t mean you need the most bleeding edge technology throughout your organization. Technology can also have high initial or maintenance expenses. So make sure you have the technology that solves for business needs, and addresses key or critical customer touchpoints. This technology can anything from a solid workforce management system, IVR, community platforms, or even an iPhone. Just remember technology is a tool, it should never be an objective. Process: Oh, I loves me some process. I don’t love process for process sake; but process that provides direction for others to empower themselves to do great things. Stop thinking as process as red tape, but instead, think of process as a foundational step that sets your workforce loose to do amazing things. Process and governance allows others to act within their guardrails and not need micro-management supervision. Set your process foundation early; establish clear roles and responsibilities, clarify what is critical to quality, outline steps, and develop your control systems to determine your effectiveness. Process aligns the organization, and mitigates good intentions without vision. Data: If I hear one more person say “Big Data is going to be important in year 20XX, I’m gonna puke. Big Data was important 25 years ago, is important today, and will be important 25 years from now. (Ok rant over) Data enables you to move forward with foundational and strategy steps. Data provides objective views on what has happened, is happening, and provides confidence in future initiatives. Decisions not based on data are gut, and therefore often personal. Personal decisions are much harder for others to get behind, and make influencing others outside of your organization more difficult. There is plenty of data out there, and much more to be found. Make sure you understand what is critical to the quality of your customer and what drives those metrics. All the other data is nice to have, meaning unless you have extra analytical resources or time, focus on what is most important and dive deep. Far too often, we spend weeks developing and designing strategy without ensuring it can be supported by a strong foundation, like the library at UMass. The strategy can be beautifully constructed, innovative, and inspirational, but you don’t want to try executing it while proverbial bricks rain down. 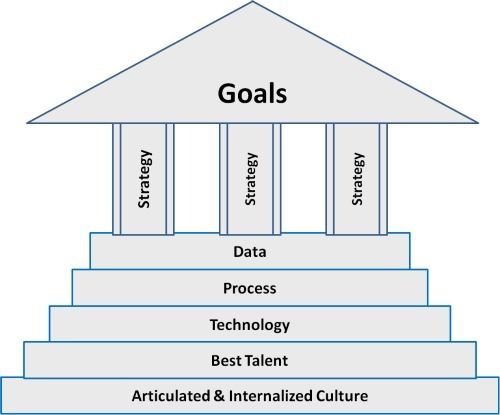 Before you go much further, make sure your foundation steps (Culture, Best Talent, Technology, Process and Data) are in a place to carry the weight. Have you ever tried executing a strategy with a faulty foundation? Were you able to correct in time? When did you know your foundation was shaky? Have you ever had a strategy executed near flawlessly because of your foundation?